Advertisers can now stay on top of their Sponsored Products campaign budget status with new notifications and tailored recommendations designed to keep your campaigns live throughout the day. Once a daily budget is spent, your campaign is paused and ads will not serve until the following day or until the budget is increased. Since Amazon customers shop for products throughout the day, you could miss potential ad impressions and sales if your campaign is paused. Start using the budget tool today to keep your campaigns running continually and help maximize your sales opportunities. 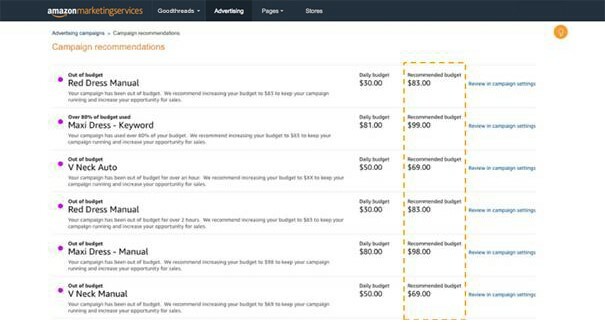 Real-time budget notifications now appear at the top of Campaign Manager in both Seller Central and advertising console (formerly Amazon Marketing Services, or AMS) accounts, where advertisers create and manage their ad campaigns. By viewing notifications when you log into your account, you’ll know when Sponsored Products campaigns are out of daily budget or have spent at least 80% of the budget, as well as the total number of campaigns affected. Click your notification to see recommended budget increases for each campaign that is out of budget or at risk of going dark. Recommendations are based on the campaign’s historical spend rate, expected traffic, and seasonality. These are updated in real time based on both changes you make to the campaign and Amazon traffic variations. 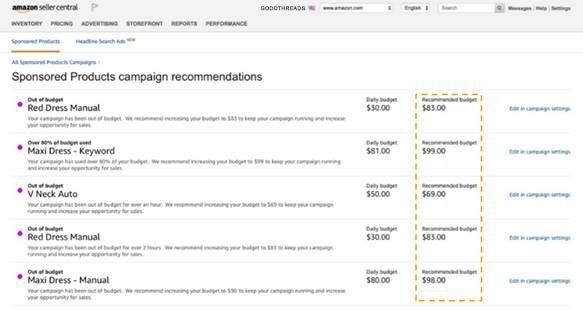 The links will take you directly to Campaign Settings, where you can apply the budget recommendation with one click and keep your campaign running. Start using budget notifications and recommendations today by signing into your Seller Central account or advertising console account.